Alter Ego: Are you really going to push that “publish” button and depress everyone? Me: Well that’s not why I am writing all this. Me: I am not sure why. Alter Ego: Then why bring everybody else down? Who wants to read this crap? No one wants to be dragged into your grief about your dead child. Who wants to hear about that? This is your journey not theirs. Alter Ego: You know people are going to feel forced or obliged to reach out because they feel sorry for you. Me: I wondered about that at first. But friends and family have been very supportive. I don’t think we grievers give others enough credit. Alter Ego: Then what’s this all about? Me: I think it’s OK to express grief. We used to wear black to let the world know we are hurting. For some reason now we are supposed to buck up and deny the hurt, get back on the speed train and move on. People should not feel ashamed of hurting. Alter Ego: Do you really think anyone cares? Alter Ego: But why put that on Facebook Debbie Downer? Me: Because that’s where people are. We’ve made Facebook our own fake reality show. A lollipop land of shiny faces, perfect families–sons and daughters. Alter Ego: What’s the matter with that? Me: When you look over the landscape it looks like everyone is having a perfect life. And it’s a dangerous façade. Those suffering think no one wants to hear what they have to say because it reveals the darkness in their soul. So they feel ashamed and they keep it to themselves. But we need to listen. Or we lose people we love– like I did. Alter Ego: So you want to make social media depressing is that it– a big whine fest of hurting souls? Me: No. I want hear the good stuff, too. But I don’t want to bury the hurt. 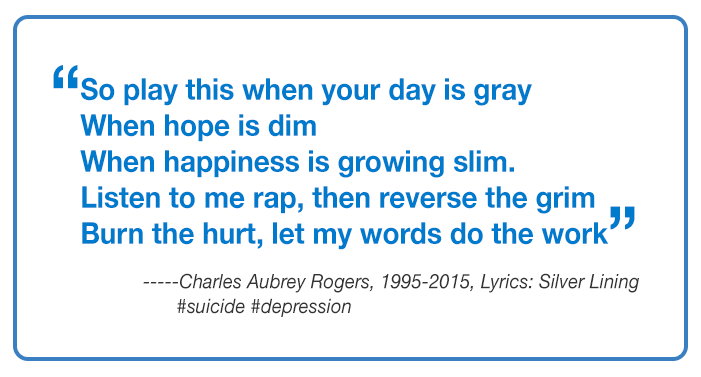 Charles buried the hurt but used his lyrics to express it. It offered him relief. I am doing the same. It’s a release for me, too. Alter Ego: Charles would want you to do this? Me: Yes. I didn’t realize that until right…now. Thank you Charles. Alter Ego: I understand now. Push that “publish” button. You’ll drive me nuts all night if you don’t and I won’t get any sleep! Do you have a Subscribers link on your blog for an email address that when you post a new article we get a notification? I think you can “subscribe” to the rss feed on the right hand side. i don’t have the sign up form. I can look into that today, though. Thanks for the reminder. Thank you for visiting and commenting. Thank you for sharing your battle with your alter ego. You made a great point about seeing all of the perfect lives on Facebook. I have felt isolated, because I was so different, going through this grief. Luckily, we are strong enough to get through this. That isn’t the case for everyone…Sending love, hugs, understanding and support for your highs and lows and gratitude for empowering posts.